In my mind, the PPG was always something of the ‘Holy Grail’ of SUP racing; I’ve loved watching it over the past three years since I began racing in the UK, with a vague hope that ‘maybe one day’ I’d have the opportunity to go and do it myself. When the ICF were forced to cancel their race event in Portugal I found myself in need of an alternative. A few fortuitous circumstances later and I was on a plane bound for LAX! Arriving late Thursday night I only had Friday to prepare. After several weeks without any swell at Dana Point, there was an excited buzz on the beach as the 4-7ft sets rolled in and were forecast to stay the whole weekend. Seychelle (my online coach) and Anthony Scaturro of SIC MAUI had kindly arranged for me to borrow a 12’6 SIC RS which I collected from Mike Eishert of the brilliant Paddle Academy. It worked brilliantly with my Black Project Sonic fin. I’ll never forget how warm and friendly a welcome this community of paddlers gave to a complete stranger; there was an inclusive, happy, relaxed feel to the place. All the world’s elite were there, but there was no elitism. I made my way to the line up for the distance race, encouraged by the choppy, windy conditions which looked a lot like typical conditions back home in West Cornwall. As we warmed up I noticed a woman with the name of her child taped to the front of her board. It was lovely to share a pre-race moment with Ariel Amarel of Canada, who knew exactly what it meant to be there, inhabiting that unconventional space between ‘nurturer’ and ‘competitor’. On the line up I found myself between Shae Foudy and Surf Life Saving Legend Jordan Mercer! I chose to be amused instead of intimidated. The gun went off and I took on a comfortable pace, getting myself into a draft train. I looked up and was surprised to discover that I was being led by former and current World Champions Lina Augaitis and Sonni Hönscheid. I was keeping up easily and very quickly realised the SIC RS was my dream board – it glided over the bumps and chop like a magic carpet! I stayed with Lina and Sonni until the second lap when they pulled away, leaving Jordan Mercer, Jade Howson and I to battle it out. Looking back over the SUPracer commentary Chris Parker is heard to say: ‘There’s Jordy Mercer, probably the strongest female paddler on the planet’…. There was no reference to the unknown entity (yours truly) who was towing her around the course! I pulled away from Jordan and Jade on the home straight to get a good 40 second lead. I promptly lost this on the way into the shore, getting caught up in the impact zone for an agonising amount of time. Despite this I finished a respectable 12th amongst the world’s best in the distance race, getting ahead of several much better known European names. The afternoon was all about tackling the first heat of the technical race and later the repercharge. Conditions were pretty wild, some of the toughest I’ve paddled in. Whilst I was strong on the upwind stretches and hugely improved my white water ‘pop over’ by the end of the day, I just didn’t have the board handling skills required in surf that big and kept losing places on the infamous hammer buoy stretch. Those sorts of skills come from 100s of hours on the water, which as a late starter/weekend warrior, I have not yet accumulated. Efforts are being redoubled on that front. There was a moment of grace when on the final stretch of the repercharge a huge set came through and I caught a bomb from the turn buoy way out back, surfing it all the way to the beach, whooping with joy (and relief)! I missed out on getting through to the final by one place, but was absolutely stoked to have taken on and completed the world’s toughest SUP race course twice in one afternoon. Not getting through also meant I was able to watch the men’s and women’s finals live and up close the next day – the greatest paddling show on earth – it did not disappoint. I found out later that I had won the Masters Pro Category, beating some established American and Canadian racers and also placed 16th in the overall women’s pro class. I was pretty chuffed. GB SUP team mate Marie Buchannan said before I left that I would come back a stronger paddler and she was right. I had to conquer so many fears in one day and came away with much more confidence in my paddling strengths and more determination to work on my weaknesses. It’s an event that I would wholeheartedly recommend to every UK race paddler. Not just for the incredible challenge on the water, but for the carnival like atmosphere; everyone was just so happy to be there, celebrating our sport, loving the ocean, encouraging each other. On that note, I’d like to make a bit of a rallying cry – we are an island nation – wouldn’t it be great if we had more ocean racing? The future of the sport, particularly in its bid to make it to the Olympics, will rest in ocean racing (this isn’t to say there’s anything wrong with inland racing on non-tidal water). But IMO only this format offers the media-worthy thrill and excitement to both paddler and spectator alike. If the UK is to fully develop its potential on the international circuit we should be making much better use of our incredible coastline and pushing ourselves as a body of paddlers to acquire ocean racing skills. BaySUP and the Celtic Cup are doing a fantastic job, but we need a national series of ocean race events. Dom Moore of Surf Sanctuary tried to run a ‘Battle of the Paddle’ style event at Fistral a couple of years ago – a spot which rivals Dana Point for its surf and beauty – but not enough people signed up for it to run. 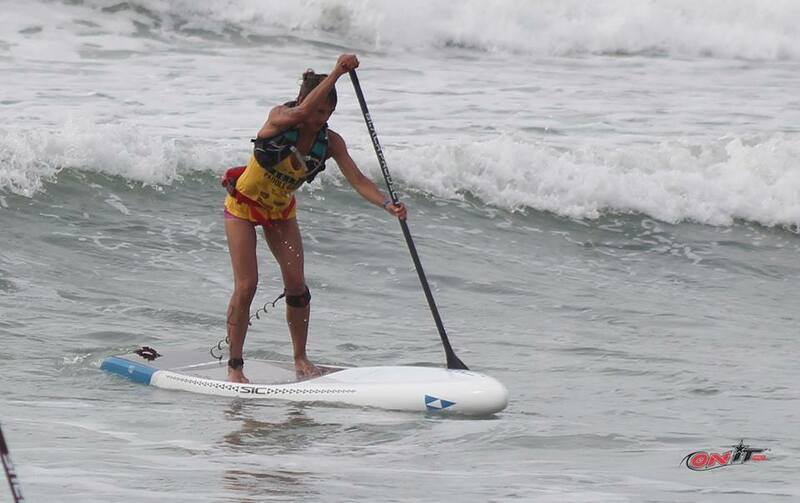 I overcame my fears, made lots of mistakes and battled around a course in front of the gaze of the global sup community. Of course that was frightening and embarrassing at times, and yet at the end of it all, I had the best day I have ever had on the water. The sense of satisfaction upon completing that sort of challenge is immense. Let’s build and grow ocean paddling in our nation, allowing ourselves to experiment with different race formats, allowing ourselves to be imperfect, to make mistakes and get out of our flat water comfort zones. If we do this I’m convinced athletes from other disciplines will be attracted to the sport too and the racing element of our sport will begin to grow as it should. We need to attract international paddlers to our gorgeous coastlines (not our murky rivers). Let’s work to position the next generation of UK paddlers to be world class, world champions. We can do this.